International Review of Social History, a leading journal in its field, attempts to combine theoretical innovation with thorough research. The oldest scholarly journal of its kind, it is distinguished for the quality, depth and originality of its articles. It also publishes book reviews, a bibliography of social history titles, and an annual supplement of specially commissioned essays on a current topic. 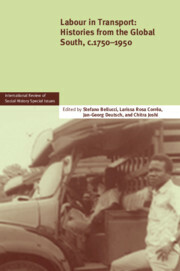 Addressing issues of immediate interest, the supplement contributors bring different perspectives and distinguished scholarship to the subject of social history. The End of Labour History?